In bid to win the customer relationship, solar companies like SolarCity are expanding their offerings. Residential solar companies like SolarCity have been one of the utility industry’s biggest headaches over the last few years. But while utilities are worried about the impact of rooftop solar on the grid and to their bottom line, these players have their eyes set on the ultimate prize: The customer relationship. Today, utilities have one big advantage over solar companies: They already own the customer relationship. But utilities have an arguably proportionate disadvantage: They are typically not allowed behind the meter and in the customer’s home. Unburdened by the regulatory compact that restricts utilities, new market entrants such as solar leasing companies have "ambitions to become a new kind of utility," Tendril CEO Adrian Tuck said last year. Last week offered the latest example of this trend. SolarCity, the nation’s largest residential solar installer, announced a partnership with Nest Labs, the Google-owned maker of the Learning Thermostat. The move is part marketing and part research: The first 10,000 customers to sign up with SolarCity after the announcement will receive a free Learning Thermostat, giving SolarCity a customer acquisition boost and an opportunity to study how solar homes can increase their energy savings. But the partnership also opens up another tantalizing possibility: SolarCity and Nest can bypass the utility and set up shop inside the customer’s home. The SolarCity-Nest partnership is "part of a broader strategy to be more than a solar company," Ryan Hanley, senior director of grid engineering solutions for SolarCity, told Utility Dive in an interview. "We’re not giving away Nest [thermostats] as a marketing ploy," Hanley said. "We want to understand … load control, what that thermostat does, and how could it cooperate and integrate with solar." SolarCity is not alone. "We’re really seeing a fundamental shift right now in the way solar players and service providers are addressing the residential consumer market," Omar Saadeh, senior grid analyst at GTM Research, told Utility Dive. "In the not-so-distant future," he continued, "we could see a very capable bundled solution from SolarCity, possibly including Tesla residential battery storage, Nest energy management, and solar generation — all under some sort of financing agreement." Solar companies like SolarCity are just one of many players looking to play behind the meter. While the home energy market once "seemed to be a secondary option reserved for the tech-savvy consumer," it’s now "turning out to be the low-hanging fruit that everyone wants a piece of," according to Saadeh, who recently wrote a report on energy in the connected home for GTM. "Home energy management has garnered a lot of attention from the telcos, the home security [firms], and big box retail providers." "The lines are being greyed out," Saadeh said, referring to the traditional delineations between solar companies, energy management companies, internet providers and big box retailers in the connected home market. Saadeh believes residential solar providers are "very uniquely positioned in this field." Due to heightened competition and the looming expiration of the investment tax credit, solar companies have started establishing partnerships based on mature technologies like thermostats, he said. But there have also been exploratory efforts looking at energy storage and EV charging. "[C]ommercial roll outs haven’t occurred yet on those exploratory efforts, [but] players have indicated larger scale ambitions in the next few years," Saadeh said. Utilities see this coming. The Edison Electric Institute’s (EEI) landmark report "Disruptive Challenges: Financial Implications and Strategic Responses to a Changing Retail Electric Business" found that the rise of distributed energy resources would cause serious financial challenges for the utility industry. Utilities and third parties are both positioning themselves to own the American consumer's relationship with energy. But one big question remains: What role will the utilities have, and what role will competitive third parties play? Utilities today "don’t really have any avenues to make money providing higher level services," SolarCity's Hanley said. EEI, the trade group for investor-owned utilities, suggests that utilities should be in the business of developing distributed technologies and services themselves. "Utilities must be able to go 'behind the meter,' so to speak, in order to provide full customer service and a range of options to their customers," David Owens, executive vice president of business operations and regulatory affairs at EEI, wrote in the trade group’s Wall St. briefing for 2015. "In the end, we envision utilities providing all sorts of distributed energy resources and technologies — including rooftop solar, microgrids, storage, and also energy efficiency and demand response—that are integrated across the grid." 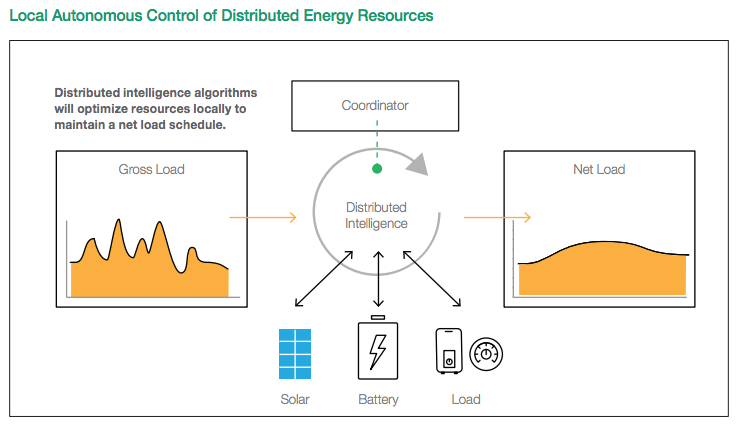 It’s clear utilities want in on the distributed energy business, one way or another. But competitive players like SolarCity largely reject the industry’s arguments that utilities are best positioned to provide these services directly to consumers. "We welcome that being part of the [broader] discussion" about the utility regulatory framework, revenue model and incentive structure, Hanley said. Duke Energy, the largest U.S. utility holding company today, is one of many utilities exploring new business models around distributed energy. Duke is looking "really to see is if we can build, operate, and service a microgrid by ourselves," according to Jason Handley, Director of Smart Grid Emerging Technology and Operations at Duke Energy’s emerging technology office. "We know someone is going to do this in five, 10 years — whenever the cost structure gets better," he said earlier this year. "Why not us?" SolarCity announced its microgrid product last month. "Moving into microgrids is a statement about how we view the evolution of the grid," Hanley told Utility Dive. The company views the product as "a template that can be scaled up to basically be the next-generation grid," according to Peter Rive, the company's co-founder and chief technology officer. Top SolarCity executives have long held "that if there was a utility that was particularly aggressive, they could manage their distribution system far more efficiently through distributed resources," Rive said in an interview with the New York Times when the company’s microgrid product launched. Eventually, they simply wondered: "Well, why don't we actually run the grid?" SolarCity says it has no actual plans to run the grid itself. But it does think it can help utilities do so. While the nation’s residential solar installer has aggressively marketed itself to utility customers — simultaneously making the grid harder to operate and eating into the utility’s bottom line — SolarCity does not see this as "a zero sum game," Daidipya Patwa, SolarCity’s microgrid product lead, told Utility Dive. "We think that we can help utilities take advantage of distributed energy resources," Patwa said. "In cases where they don’t necessarily have the platform to do so, we want to provide that platform to make it easy for them." A 'god platform' for the grid? One of the biggest challenges facing utilities today is operating the distribution grid with high penetrations of solar on it. "No one really cares about one 5 kW solar panel on a circuit. But utilities do care about 1,000 5-kW panels," Hanley said. "We are getting into big numbers that have an impact on utility operations." "The technical concerns by utilities are valid," he said, "but they can be overcome — and will be overcome." SolarCity’s ambitions are to be the leading energy delivery services company, which means a lot more than simply installing solar panels on a customer’s roof. SolarCity wants to provide energy, demand response, capacity, reactive power support, and other non-energy products to the grid, according to Hanley. "If you think about SolarCity and our competitors, we have hundreds of thousands of customers and … aggregation of those assets becomes pretty powerful," Hanley said. 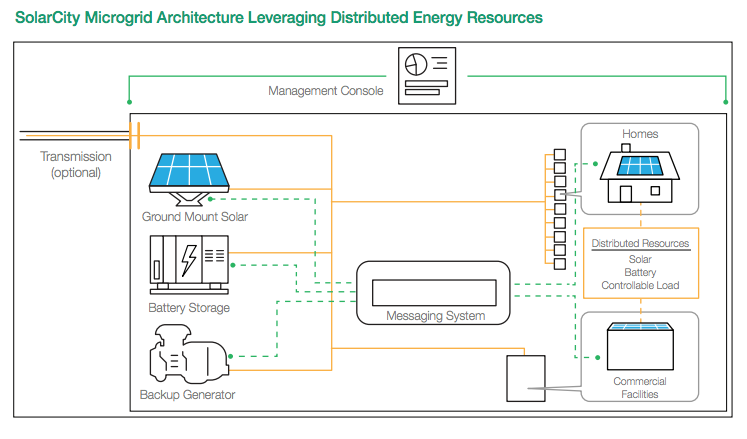 SolarCity confirmed to Utility Dive that it is building an aggregation platform for all of its assets, essentially a virtual power plant that can be used to help utilities integrate DERs. "We offer coordination and control [of these assets] to any utility that wants it. That means us integrating into their control platform and distribution control center, so that they can change inverter settings or request discharge from a battery at a certain time," Hanley said. "That’s part of the future interaction that we certainly envision with every utility eventually." Carol Stimmel, the founder of Manifest Mind and an expert in smart grid and emerging technologies, believes that SolarCity’s moves are part of a long-term strategy to own the customer-facing energy experience and leverage what Stimmel calls "revenue-grade data." The strategy is similar to what has been done before in other industries, Stimmel said, pointing to how Apple won mobile apps by giving the consumer a seamless end-to-end experience through the App Store. "I think SolarCity really gets that and they’re positioning themselves — at least in the energy world — to be that 'god platform,' " Stimmel said. The "god platform" is a technology concept that refers to the consumer-facing meta-layer that aggregates all the connected devices and web services in the home. The concept of DER management is "becoming more and more talked about," according to Saadeh, who also wrote a report on DER management systems. "A vendor or a retail service provider — not necessarily the utility — can actually do that and aggregate a portfolio of behind the meter assets," he said. There are still many questions that need to be answered — how do providers leverage this platform across different customers? How would they sell these services into the wholesale market and to the utility? But "all these notions are coming more and more to light today," he said. SolarCity's Hanley declined to get into the specifics of any potential plans to build such a platform, only saying that SolarCity is "very aware of the value of the market … [and] there is more to the customer than their solar production." SolarCity has "done everything right" so far, Stimmel speculated. "The first thing is to figure out how to provide an end-to-end experience that involves collecting electrons from somebody’s roof. … Then the next thing they had to deal with was residential storage. … Once you get a battery in a house, then the macro grid is nothing but a big battery to you." "They’re going to let [the utility] system implicitly handle these transactions. That’s not the interesting part," Stimmel said. "The interesting part is as the complexity of the network grows and you have more of these edges connected to the nodes, then you are really only limited by your imagination as to how you can provide value-added services on those edges, on those vectors of the network, instead of the nodes themselves." "Just like a wireless mesh network, where you take a node off and it finds a new route — you don’t really care," she said. While there are many other residential solar companies, few strike a chord with utilities like SolarCity. What should scare utility executives on a psychological level is the obsessive genius of Tesla CEO and SolarCity Chairman Elon Musk, according to Stimmel. "[Elon Musk has] done the two things that every utility stakeholder should have been afraid of over the last decade – he hollowed them out and he disintermediated them," Stimmel said. "He’s got all the pieces." "They reject all the assumptions that everyone else accepts," Stimmel said. "It’s killed companies — 'Well, we want to do an energy service product, so we must get the utilities to buy our stuff.' How many companies did that kill? A lot." "SolarCity is showing up and saying, 'Hey! You’re going to do this anyways, you’ve already basically sold yourself on it, but we’ll do it for you and the economics are even better,'" Stimmel said, referring to SolarCity’s strategy of targeting customers who are already thinking about microgrids. The idea is that companies like SolarCity — whether through microgrids or rooftop solar — come in and pluck the biggest and most affluent utility customers off the top and work their way down the stack. It’s similar to the strategy that Tesla is taking in the electric vehicle and energy storage markets. "The strategy of Tesla is to enter at the high end of the market, where customers are prepared to pay a premium, and then drive down market as fast as possible to higher unit volume and lower prices with each successive model," Musk wrote in "The Secret Tesla Motors Master Plan (just between you and me)." "The key word there is 'economy,' " Stimmel said. "Wherever you can find a way that you can change the economy of delivering electricity, that’s what [Musk] is going to do." SolarCity wants to be more than a solar company. "[W]e aspire to be the leading energy delivery services company," Hanley told Utility Dive. Hanley, the former manager of smart grid technology at Pacific Gas & Electric, works on SolarCity’s grid engineering team — a team made up entirely of former utility engineers. He reports directly to CTO Peter Rive, brother to CEO Lyndon and cousin to Musk. SolarCity wants to leverage its relationship with the customer to offer new services. The value proposition that SolarCity offers is that customers save money while SolarCity makes rooftop solar "easy and seamless for them," according to Hanley. Those two things — cost and ease of use — are the same "complaints that [customers have] had with their normal interaction with their utility and the grid." "Anything that we roll out will have to abide by those paradigms," Hanley said. "I don’t think there is necessarily a box around what those products can be — now or in the future." Hanley said the Nest partnership was something that SolarCity had been working on for a while — similar to the company’s recent microgrid product, which he called "the culmination of all the different technical capabilities we have as a company." This indicates the company may already be working on other new services that have yet to see the light of day. "I don’t think there is necessarily a box around what those products can be — now or in the future," Hanley said.